An agreeable tiger moth, Spilosoma congrua. This snow white beauty appears as if it is adorned with a big feathery boa. I spent some time yesterday meeting with Dave Horn, who is an entomologist and expert on moths. We're working on a project involving moths, and the resulting publication should be pretty cool. As an offshoot of the meeting, I learned a ton of new info about moths from Dave. Thanks to Dennis Profant for giving me the correct ID of this little beauty - it is snout moth, and most likely Hypena palparia - not a horrid zale, as I thought. I had a stack of "mystery moth" photos that I've taken over the years, and Dave was able to quickly pin names on nearly all of them. 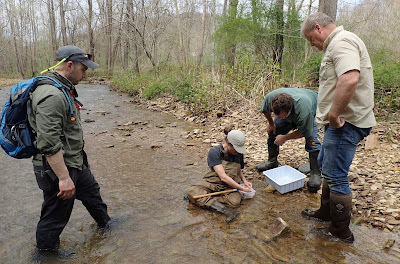 I enjoy the process of running down identifications of unknown organisms, but it is a lot faster and easier to trip the camera's shutter at a much speedier clip than one can sit down and try to identify everything. Thus, the mysteries can accumulate. Moths are very cool, and I've found myself becoming increasingly interested in them. These largely nocturnal fliers become quite addictive, actually, once one begins to really investigate them. So today I found myself lunching at the legendary Villa Nova in Worthington, Ohio, with several colleagues from work. The restaurant's front wall, right behind the sign post, became a place of great interest for our party upon exiting the joint. One of our crew, Jen, glanced over at the aforementioned wall as we left and spotted this animal. Giant leopard moth! I was of course excited to have Hypercompe scribonia land right in our lap, as it were. This find also seemed like a cool bit of cosmic intervention from Mother Nature, perhaps as a reward for my paying intention to this obscure group of bugs, and liking them to boot. You see, the giant leopard moth is one of only about 50 species of Ohio's 3,000+ moth species that Dave and I had selected yesterday for our project. And I had no good photos of this species! This old fellow has been around for a while and has become somewhat tattered. Still looks good, though. You'd think that such an outrageous looking moth would stick out like a sore thumb, and its chances of being plucked by a bird would be high. Well, they do stand out when roosting on a blank wall, but a leopard moth on tree bark can blend in quite well, all of those dots and hollowed out circles serving to break up its appearance. I happened to have a suitable container in my trunk, so we captured the leopard and transported it the short distance back to our office compound. There, I was able to make some photos of this lepidopteran bruiser, including images that show its incredibly ornate and colorful abdomen. The orange bands broken by the barbell-shaped iridescent blue marks create an almost shocking appearance when the moth spreads its wings. It may be that these are bright warning colors, which would suggest that the moth is chemically protected in some way. Or it may be that they serve to help ward off would-be predators. A chickadee investigates, moves in to nip the moth, which suddenly flips open its wings and visually blasts the bird with bright coloration. That just might work to spook the bird. Or those colors may be there for some entirely different reason. After the photo session, the leopard moth was placed in a good hiding spot among the vegetation, in a spot vastly preferable to the Villa Nova's stark wall. Even the giant leopard moth's caterpillar is cool. We found this one last year on a foray into the depths of Adams County, Ohio. The ebony larva is encircled with blood-red bands between each body segment, and fairly bristles with tufts of stiff spines. The caterpillars are polyphagous, which means they'll eat a great variety of different plant species. They've been recorded dining on everything from sunflowers to maples to violets to willows. As so many of its host plants are widespread and abundant, it means that you might luck into one a giant leopard moth nearly anywhere - even on the wall of your favorite Italian restaurant. One of the highlights of exploring Presque Isle County, Michigan, where I do my now annual NettieBay field expeditions, is the sparrow diversity. Sparrows all too often get short shrift, and are sometimes bemoaned as "LBJ's" (little brown jobs) that are tough to identify. They're really not great identification challenges, though, and under careful inspection all of them are quite showy in an understated way. Sparrows also don't generally get their due when it comes to the big picture ecological services that they provide. We had a total of 12 species of sparrows in Presque Isle County this time around, and I managed photos of a few species. ASIDE: I once read where some time management expert said a person should only spend an hour a day dealing with personal email. I wish. After ten days away, and almost no dealing with such correspondence, I returned to a boatload of messages. If you read this, and sent me something, and I haven't responded, sorry. I'll do my best to to reply, eventually. A Clay-colored Sparrow tees up on a small jack pine and imitates Pavarotti. The sound that emerges is somewhat less impressive, though. This close ally of the Chipping Sparrow emits an odd insectlike buzz, or if feeling especially robust, a short series of such buzzes. One could be forgiven for not even recognizing the Clay-colored's song as that of a bird. Another denizen of the elfin jack pine forests is the Vesper Sparrow. This one has its feathers in a bit of a ruffle, courtesy of a windy day. Vespers are far more vocally complex than Clay-colored Sparrows, and deliver a beautiful melodic song that typically begins with a few downslurred whistles. Their outer tail feathers are trimmed in white, like a junco or meadowlark. A Grasshopper Sparrow shouts his song from a ground perch. Much of this secretive sparrow's life is spent within five feet of the earth, and most of the time they're on the dirt. Non-singers are devilishly hard to locate, as they stick to dense growth and run about like mice. The song is actually a rather pretty affair, albeit reminiscent of an insect. A typical tune is a weak somewhat irregular trill, but they have a so-called "dawn song" that is more complex. But Grasshopper Sparrows hear much more than we do, and if you take the recording of one's song and slow it way down you'll get a sense of all the hidden notes that are masked to us, but audible to the birds. Resplendent in his coat of chestnut is this Swamp Sparrow, singing his rich musical trill from a young tamarack. 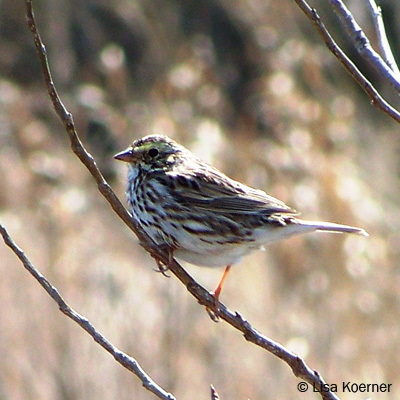 All of the open or semi-open wetlands in Presque Isle County have Swamp Sparrows. They are part of a group of songsters that might be referred to as "trillsters". Dark-eyed Juncos, Chipping Sparrows, Pine Warblers, Worm-eating Warblers, and perhaps a few others sound similar to many people, especially those just learning songs. Although all of them can be easily distinguished with practice - at least their typical songs - habitat can also provide clues to the singer's identity. None of the other trillsters other than Swamp Sparrow is likely to be heard singing in a marsh. A Savannah Sparrow sings his pleasing t-t-t--zeeeee- zzzaaayyy from a meadow fence post. Even Hollywood must find the Savannah's song pleasant, as I hear it with some regularity in TV/movie/commercial sound tracks. The Savannah Sparrow is named for the city in Georgia where the type (first) specimen was taken. But the species has an enormous distribution, occurring over nearly the entire North American continent. Something like 17 subspecies are currently recognized, and proposals have been made to split a few of the "groups" into separate species. While Savannah Sparrows are not long distance migrants, migrate they do and in big numbers. I was once with some banders that caught something like 80 of them in a small Ohio wetland in October, in one morning. This is a cold, calcareous gravelly shoreline of Lake Huron, at Thompson's Harbor State Park in Michigan's Presque Isle County. It is not uncommon to encounter migrant Savannah Sparrows in the vegetation along the shoreline of this Great Lake, or any of the others. Migrant Savannahs have a tendency to favor such shoreline habitats, feeding and foraging in the low vegetation that buffers the shore. Note the dominant grassy-looking vegetation that extends nearly from the water's edge to the gravelly dune at the right edge of the photo. It's an interesting plant species, and factors into the important role that Savannah Sparrows play ecologically. That swath of lakefront land between the water and the dune is a brutal place to grow. Ferocious storms crop up along the Great Lakes with regularity, and storm-driven waves batter the lakeshore. Most plants cannot deal with such an environment. The dominant grassy-looking vegetation in the previous photo, growing in the lakefront no man's land, is this interesting species, Baltic rush, Juncus balticus. It is one of few plants that can survive and thrive in such a hostile place. Note how the rush grows in a perfectly straight line. This is why Baltic rush grows in such linear fashion. I took the liberty of digging one out, and washing it off so we could better understand its growth habit. Baltic rush is highly rhizomatous; its shoots emerge from a well entrenched subterranean rhizome that sends up stems at regular intervals. That rhizome is tough as steel cable, and serves to anchor the rush and hold the plant in place even during the most savage storm-driven poundings. One effect of Baltic rush's prolific dominance as that it serves to create sheltered micro-habitats in which other plants that are less hardy can find a foothold. This is one of the species that prospers in shoreline Baltic rush shelters, the Garber's sedge, Carex garberi. It is a tiny sedge, often standing no more than a few inches in height, which places its fruit at just the right height to be plucked by foraging sparrows. Garber's sedge is a one of a few species in the massive Carex genus of sedges that has odd little fruit that resemble tiny berries. They're more succulent and for want of a better word "tasty" looking than the dry papery fruit of most sedges. I once had a discussion with the great University of Michigan botanist Tony Reznicek about sedges in the section Bicolores, which includes Garber's Sedge. Tony felt that the peculiar fruit of these species was an evolutionary adaption for dispersal by sparrows, and I totally agree with him. Foraging Savannah Sparrows in migration undoubtedly consume the fruit of Garber's sedge and other plants that occur along shorelines. The actual seed of a sedge is termed an achene, and they are hard and bony, and concealed within that fleshy-looking fruit. Perfect for surviving the ride through a sparrow's digestive tract, and many of the achenes no doubt eventually emerge intact from the sparrow's posterior end and often probably far distances from where the bird ate the fruit. Over the LONG haul, which is how we really ought to look at nature and the environment, sparrows such as the Savannah play a major role in the dispersal of plants. Certain plants, such as the Garber's sedge, are probably intimately linked to certain birds such as the Savannah Sparrow and depend upon these feathered couriers to transport their seeds to new sites, thus starting new plant colonies. Buy a bird - now! If you live in Ohio, and are a birder, you undoubtedly know all about the Ohio Breeding Bird Atlas II. For six years, ending last season, the Atlas organizers toiled to see that every nook and cranny of the Buckeye State was thoroughly canvassed for nesting birds. Many of the readers of this blog have contributed data towards this effort, yours truly included. That's where your help can work wonders. Buy a bird! 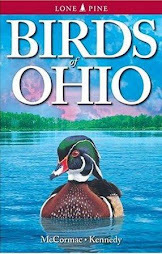 The atlas chieftains have cooked up a great scheme to help raise the necessary funds to publish a richly detailed chronicle of the breeding birds of the great state of Ohio. 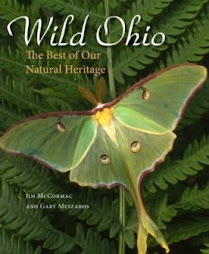 Every bird species documented as nesting in Ohio during the Atlas's run (2006 - 2011) is up for auction. 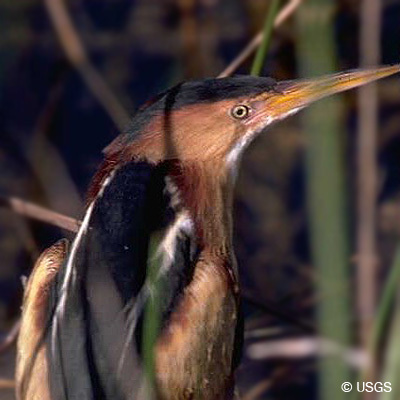 As that encompasses 195 species, bidders have lots of choices, including this Least Bittern. 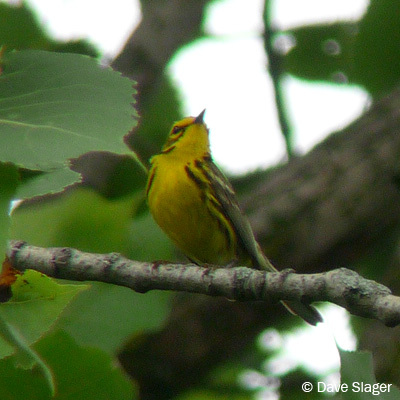 No one, amazingly, has yet bid on this gorgeous Prairie Warbler. Opening bids start at $50.00 - chump change for the good that your financial support will do. By successfully bidding on a species, your name will be linked with that species as a sponsor, and perhaps more importantly you'll be helping to enable publication of the Atlas book. Throw down on this Prairie Warbler RIGHT HERE! 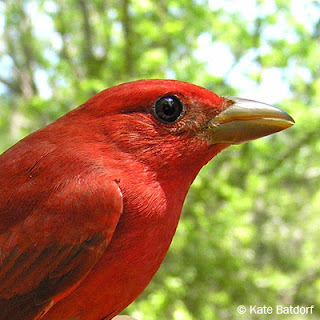 Perhaps not surprisingly this showy Summer Tanager has sparked a minor bidding war. Four bidders have run its price up to $250.00, thus far. One up all of them - do I hear $300.00? I was astonished to see that no one had thrown down cash for the Savannah Sparrow. I changed that - it's mine so far, with an opener of $50.00. Hey, take me out if you can! I've got a bid in on another species, but I'm not saying which. One bidding war is enough. Of course, you may see my other bird should you scroll through the species, as bidders and their bid are listed. The auction closes all too soon - May 31st - so GO TO THIS SITE now, and bid on your favorite species. If someone already has, outbid them! No need to instantly pony up the cash; if you're the winning bidder, you can pay later. Supporting the publication of the Ohio Breeding Bird Atlas II book by "buying" a bird is a simple and fun way to help science, and by extension help the birds themselves. All of the auction details are RIGHT HERE. Everyone loves a warbler. These colorful sprites are, to many, the avian highlight of spring. I am not impervious to their charms, and one of the great things about visiting northern Michigan's Presque Isle County is the numbers and diversity of warblers. During the nine days I was there, my groups and I tallied 25 species, nearly all of them breeders. Following are a few shots that I managed to click off, all with my new Nikon Coolpix P5100. When leading groups or otherwise engaged, I like having a higher end "bridge" point and shoot around my neck. Toting the SLR and its accouterments just isn't practical in such situations. The P5100, by the way, is AWESOME! It has an incredible 42x zoom that actually holds up well at its higher ranges, and the camera does well with macro, landscapes, and video. Hard to beat if you're looking for a versatile non-SLR camera (no connections with Nikon, me!). An adult American Redstart, in a rare moment of repose. These animals are feathered bulls in leafy china shops, engaging in a shock and awe foraging strategy. They rage through the vegetation, flicking and fanning those brilliant orange wing and tail spots, literally spooking the insects from the foliage. Fleeing bugs are snatched in flight, and the redstart is aided in aerial captures by stiff rictal bristles that line its mouth, thus effectively increasing the bird's gape. Perhaps the most common breeding warbler in Presque Isle County is the Nashville Warbler. This species is quite facultative - a generalist - in its habitat requirements. They can be found in nearly every forest type, in most successional stages of woods. I would be loathe to cast a vote for the most beautiful warbler, but if my hand was forced my ballot might go to the Chestnut-sided Warbler. This species prefers young scrubby growth, such as shrubby thickets, woodland margins, and regenerating clearcuts. It is quite common in Presque Isle County. The classic Chestnut-sided Warbler song ends with an emphatic "swee-swee-CHU!" Such typical songs are easily recognized, but these warblers also deliver soft jumbled whisper songs that can be impossible to separate from alternate Yellow Warbler songs. Peeking coyly from a tuft of white pine needles is a truly shocking bird, the male Blackburnian Warbler. Their songs are very high in pitch, and I think that certain renditions travel so high up the scale that even the best of ears cannot hear the entire melody. A Mourning Warbler, always a crowd-pleaser. They aren't especially common, and are adept at skulking in dense cover. Their quick husky songs can easily be lost among the chorus of neighboring singers, but song is the best way to find them. I had heard this bird some ways off, and was able to array the entire group in a good viewing spot. We eventually managed good looks, and this bird became nearly everyone's life Mourning Warbler. One of my favorites of the Presque Isle breeding warblers is the Golden-winged Warbler. They aren't especially early returnees, and males are still showing up on territory while I am up there. The male resembles a chickadee with a yellow cap and gold ingot stamped on its wings. This species is closely related to the more southerly Blue-winged Warbler, and hybrids are frequent. When I hear a Golden-winged singing its buzzy ZEE zee-zee-zee or some variation thereof, I always try and run down the singer. Once, a hybrid Brewster's Warbler popped out of the thicket, and I'm sure the hybrids are not all that rare up there. Note how this bird has a yellowish wash below its bib - normal variation or evidence of backcrossing? Black-throated Green Warblers are quite common, and their breezy zee-zee-zee-zoo-zee songs are simple to learn. If the singer is announcing its territorial boundaries to rivals, it will sing a more aggressive ZEE-ZEE-ZOO-ZOO-ZEE version. We had an interesting experience with this bird. It was singing and foraging near our group, allowing for great looks and we were enjoying the opportunity to admire the bird at close range. Suddenly it came down low into the boughs of a spruce - 15 feet from the group - and settled in for a nap. For at least five minutes it remained stone still, and shuttered its eyes. When nap time was done, it shook itself awake and resumed activities. Resplendent in its zebralike finery, a male Black-and-white Warbler poses for the camera. While not colorful, these warblers have a strikingly beautiful pattern, and I notice that they always generate enthusiastic receptions from observers when seen well. The male's high-pitched wispy song is often likened to the sound of a rotating wheel in need of grease: WEET-see, WEET-see,WEET-see. During this expedition, I "discovered" a massive stand of elfin jack pine forest that was new to me. The Michigan Department of Natural Resources and the U.S. Fish & Wildlife Service manage extensive areas of jack pine to perpetuate habitat for the Kirtland's Warbler. These trees are only about seven years old, and the stand seemingly had a full complement of warblers. This was probably only the second year that warblers occupied the stand. By 20 years of age, the trees are too mature and the Kirtland's Warblers' abandon the habitat - thus, the need for ongoing large-scale jack pine management. Although sometimes termed jack pine "barrens", these forests are anything but stark. The botanical diversity in the herbaceous layer is great, and includes many interesting plants. The plant diversity, in turn, spawns scores of insects, which become bird food. Other avian species that share the Kirtland's jack pine habitat include Clay-colored and Vesper sparrows; Hermit Thrush; Upland Sandpiper; Nashville Warbler; Brown Thrasher; and others. I was pleased to find a territorial Palm Warbler in the habitat in the photo above. This species is expanding its range into stunted jack pine forests in the northern Lower Peninsula of Michigan. On my last day in Michigan, after everyone else had left, I made a final stop to spend time in the jack pines. I had figured out the pattern and territorial boundaries of one particular Kirtland's Warbler, and quietly lay on a soft bed of Pennsylvania sedge (Carex pensylvanica) in his turf. As the bird made its rounds, it of course noticed me prostrate on the ground. Singing all the while, it hopped to the base of a nearby jack pine and to within three feet of your narrator. At one point, I was certain that the bird would hop on my leg. Its rich boisterous song is LOUD indeed when delivered a few feet from one's ear! After concluding I was rather boring, apparently, the Kirtland's Warbler continued on its rounds and I slunk off, richer for the experience even if the bird wasn't. 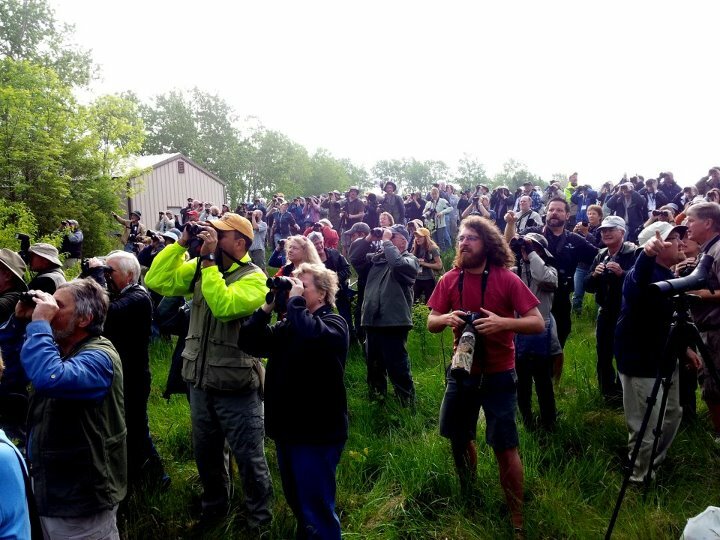 This is not a crowd gathered for an outdoors performance by the Rolling Stones - it is the mob scene that formed following the discovery of a migrant Kirtland's Warbler at Ohio's Magee Marsh Wildlife Area a week or so ago. I've seen this photo several places, and apologize for not being sure of who the photographer is, although I think it may be Gunnar Engblom. Hopefully Gunnar - or whoever took it - will not mind me sharing it here. There are only 3,600 or so Kirtland's Warblers on earth, and their charisma is evident by this photo. It's as if the bird was a powerful magnet and all of these people had iron in their binoculars. In spite of the horde, the Kirtland's Warbler probably wasn't intimidated in the least, as they are by nature tame and confiding. I'm sure many birders got their life Kirtland's Warbler here, and I'm glad for that. Still, I'd much rather savor the birds in the lonely jack pines, with no one else around. Stately and columnar, a grove of red pine, Pinus resinosa, towers over the sands of Presque Isle County, Michigan. Pines - jack, red, and white - comprise a large and important part of northern Michigan forests. All three are native, and form natural stands, but all species are also planted, such as the grove above. Pines harbor lots of life; everything from Yellow-bellied Sapsuckers, Pine Warblers, Red-breasted Nuthatches to all manner of interesting insects. Our party had stopped for lunch at a campground that was liberally grown over with all three native pine species. While eating our lunches, we were pleased when a female Merlin flew over, scolding heartily. It turned out that she had her nest nearby, and off some of us went for a discreet look. Upon our return, I was quite pleased to see that other members of the expedition had captured a most interesting and showy beetle. It turned out to be a northeastern pine sawyer, Monochamus notatus, which is a wood-borer that specializes in conifers. While this insect can be very common, one doesn't often see them, or at least I don't. So, we took the opportunity to make some photos. Pine sawyers are not small bugs, and their antennae are impressive by any standard. Much of a pine sawyer's life cycle is spent as a large white grub, chewing its way through the wood of dead or dying pines. I would think that one of these grubs would be a woodpecker's culinary dream, and the beetle larvae are probably an important reason as to why there are so many woodpeckers in these piney woods. Great plains puccoon, Lithospermum caroliniense, provide colorful punctuation to the white sands of Lake Huron dunes. 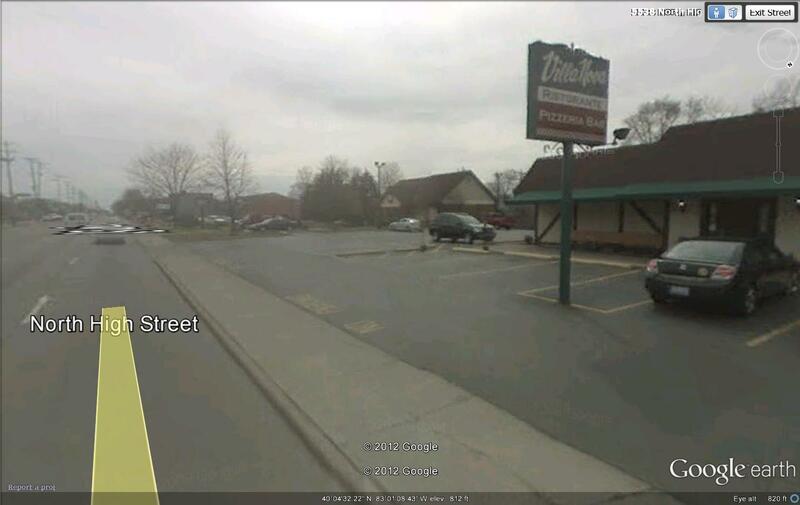 Finally, after nine days on the road, I find myself back in Ohio. The time away was well spent; I was exploring what may be the most beautiful and most biodiverse county in Michigan's lower peninsula, Presque Isle. Following are a few pictorial highlights. Cool sheetwater flows onto limestone pavement along Lake Huron, forming a spectacular fen. Many rare and unusual plants grow here, including carnivorous pitcher-plants and sundews. Wilson's Snipe nest here, and the males deliver their incredible aerial courtship displays overhead. A brilliant dash of orange, courtesy of an Indian-paintbrush, Castilleja coccinea. This plant and many others grew in an interdunal swale along the Lake Huron shoreline. Many species of breeding warblers occur in the buffering spruce-fir-cedar-tamarack forest. Common as spring-beauties in Ohio, lovely fringed milkworts, Polygala paucifolia, pepper Presque Isle County's forests. An inquisitive thirteen-lined ground squirrel, Spermophilus tridecemlineatus, peers at your narrator. These prairie dogs are common, and are preyed upon by another much more ferocious mammal, the badger. Stunning Ocqueoc Falls, the only waterfalls to be found in Michigan's lower peninsula. Bear Den Lake, one of many glacial kettle lakes in the area. Nearly all of them have their pair of resident Common Loons. Thousands of acres of elfin jack pine forest blankets the dry sands in the southwestern portion of Presque Isle County, and the counties to the south. These trees are about 6 or 7 years old, and will support nesting colonies of Michigan's most famous songbird for another 14 years or so. A Kirtland's Warbler serenades your blogger. I took this shot in the forest in the previous photo. Many male Kirtland's Warblers had set up territories, and in such young pine stands it is very easy to observe these tame birds. Their loud song carries some distance, and has a curious reverb quality. Day's end sunlight sets the woodlands aglow. The kettle lake in the foreground harbored Black Terns, nesting Hooded Mergansers, and many other bird species. This was the third year that I've led birding/botany/natural history forays in Presque Isle County, and I've learned many of its interesting nooks and crannies along the way. Our adventures are based out of NettieBay Lodge, and we'll be doing it again in May 2013. If you're interested, send Jackie a note at NettieBay, or ring her up at 989-734-4688. This female Belted Kingfisher must have just emerged from a fishing expedition. She looks to be badly in need of a hairdresser. Photographed in the wilds of Presque Isle County, Michigan. A lone pink lady's-slipper, Cypripedium acaule, stands sentinel in a dry northern Michigan woods. We've been exploring far and wide in the incredibly diverse habitats found within Presque Isle County. This may be the most varied of lower peninsula counties - it has it all. 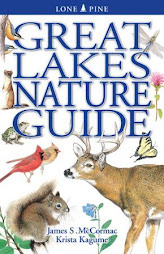 Beaches, alvars, and fens along the Lake Huron coast; cold spruce bogs; dry jack pine forests; cedar swamps; marshes and much more. Yellow lady's-slippers, Cypripedium parviflorum, framed by white cedar. Along with all of the habitat diversity comes a great variety of plant life; staggering in places. The lady's-slipper orchids are always a hit. From my experience, pink slippers - such as in the first shot - are rather local, and a bit hard to find. Not so with the yellow slippers; get yourself in the right spot and they, dare I say, can practically be weedy. The slippers in this photo are especially noteworthy as they are two "doubles" growing side by side. Most yellow lady's-slippers sport but a single blossom; every now and then one is found with two flowers. I don't think I've ever run across two side by side doubles, and needless to say, many photos of this photogenic pair were made. I'll never tire of looking at these fabulous orchids. The name "lady's-slipper" stems from the flowers' appearance - they look like little shoes. The cream of the lady's-slipper crop awaited us in this rather unassuming pineland. Overlain by towering red pines, the rather barren and acidic soil hosts a dozen or so very special orchids. A true elfin of the orchid realm, a ram's-head orchid, Cypripedium arietinum. These tiny lady's-slippers rise to a height of eight inches or so, and are very easy to miss. I had found three plants not far from this spot, two seasons ago. Nina Harfmann went out the other day to scout for them, and thought she was in the correct spot. She wasn't, but as fate would have it her directional miscue stumbled her into the path of this even nicer group of ram's-heads. Blood-red-maroon below and frosted white above, the ram's-head flower is copiously fringed with tiny white hairs. The flower is small indeed - only an inch or so long. They're a treat to behold, and a photographer's dream. We took the group to admire these ram's-heads this morning, and they elicited many oohs and aahs, and scores of photos were made.